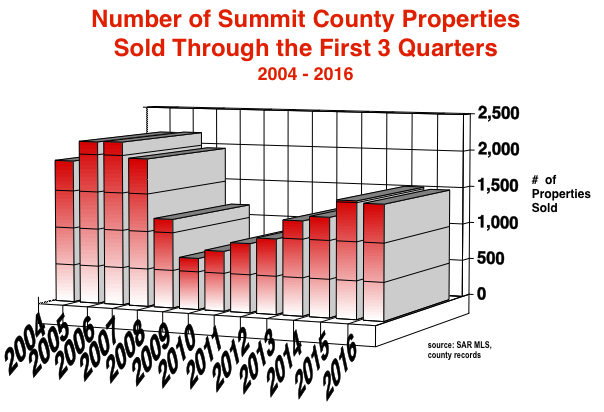 The Summit County real estate market ended the 3rd Quarter with fewer than 900 properties for sale continuing a historic lack of inventory for the third year. The supply has not reached even 1300 properties for sale since mid 2015 and this year barely climbed to 1000 at the height of listing season in July. The accompanying graph shows that the market is terrible for buyers in the under-$600,000 price range. If you are looking under $600,000, good luck. Only 129 properties in that range are for sale in the whole county. 868 of them sold in the first nine months of 2016. There is about a one month supply. If you are looking for something under $200,000, get ready to rumble. There were 7 for sale on October 1, about a 3 week supply. Multiple offers and bidding wars occur on almost every sale in the lower end of the market. Lots of hard feelings ensue because the losers generally have to wait days or weeks for the next opportunity and then the scuffle begins all over again. For the first time in my 30 years of experience, I’ve seen buyers adding escalator clauses to their offers promising to beat any other offer by $500 or more. Some put a cap on the price they will go up to, others don’t knowing that their competitors will just go $500 above that cap and win the property. Meanwhile, at the other end of the market, million dollar properties are the only over supplied segment of our inventory – and way over supplied at that. Nearly half of the residential inventory is in the over-million dollar range. And this segment represents only ten percent of the market. One hundred more million-dollar homes are now on the market than have sold so far this year. Of the 254 such homes for sale, probably less than one hundred will sell in the rest of the year. The $700,000 to $1,000,000 market is generally in balance with just about as many for sale as have sold this year. By area, Frisco is the tightest market with only 27 residences for sale at the start of the 4th Quarter, less than a 2 month supply. 144 had sold to that date. Keystone, Dillon/Summit Cove and Wildernest/Silverthorne had about a 3 month supply each. Breckenridge had a 4.5 month supply reflecting the large number of slower selling million dollar homes offered there. Copper Mountain had a whopping six month supply, although that is probably the tightest that market has been for years. 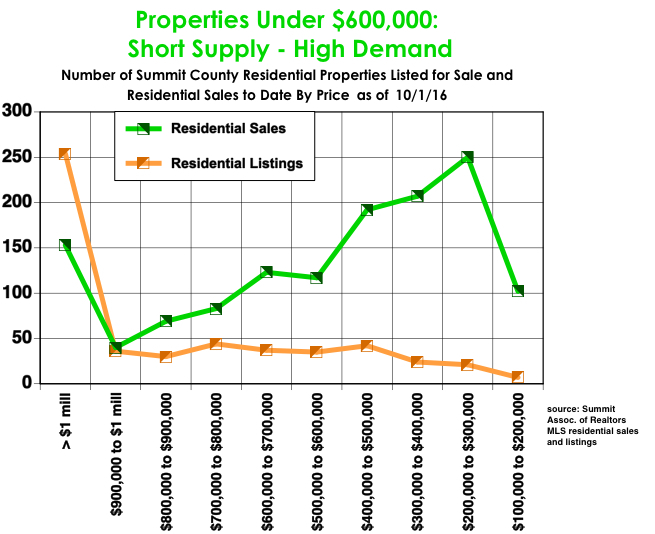 For reference, Summit County normally has about a year’s supply of property for sale. Generally this screamingly tight inventory would be driving prices up like a rocket, but not this year. Through the 3rd Quarter prices were about 3 percent higher than this time last year. Average price usually doesn’t increase much if at all in the 4th quarter so this will be a slow appreciation year. Although buyers are standing in line for the next listing to drop, they will only pay so much. As prices regain the historic highs of 2008 and 2009, buyers are getting cautious. And appraisers are as well. Sellers must set asking prices precisely right to avoid getting stuck on the market with no showings or offers or to not appraise if they do go under contract. Every day the MLS shows about as many price reductions as new listings so many sellers are miscalculating and expecting the low inventory to save them. Properly priced properties are selling in days if not hours and closing in an average of 113 days. So what’s going to happen? Will the inventory increase rapidly after the election? Will more buyers appear once the massive uncertainty and fear are over? Will the Fed raise interest rates once it looks like things are settling down? Will that drive buyers to act or cause them to shrink back? Will Frodo take the Ring to Mt. Doom and save humanity? This market will probably muddle along at about this rate with prices and volume in this same neighborhood for a year or two while sellers slowly dribble back to activity. We’ve just been through a long period of events and negative economic climate, mostly self-induced, that have made second home buyers and sellers hang back. The damage has already been done and it will take both buyers and sellers a while to get over it.